Media > Reasonable Faith Podcast > Is the New Atheism Dead? KEVIN HARRIS: Bill, a popular atheist blogger says that the New Atheism is a train wreck. 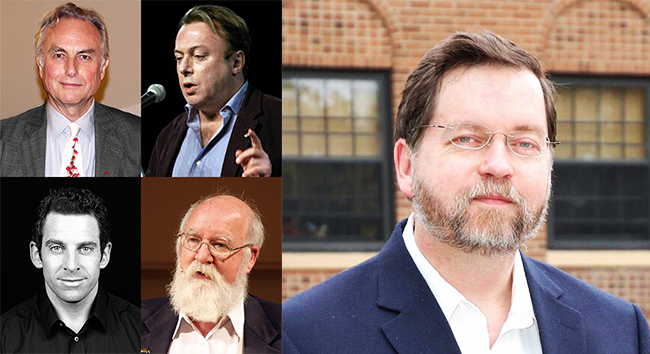 When you read the headline to this article, that’s what it says – “The train wreck that was the New Atheism.” It is from biologist and associate professor at the University of Minnesota, PZ Myers. PZ Myers has been a very vocal atheist. He’s quoted a lot. Dawkins has quoted him on occasion on some things. He says that the whole thing was a train wreck. This is an interesting article in that it kind of goes back and reminds us how this whole New Atheism started. It really did start with 9/11. Sam Harris's book. And suddenly Christopher Hitchens lecturing and speaking out against religion. Wired magazine is the one that coined the phrase and kind of set it in motion – codified – the New Atheism when they did this. Now PZ Myers is saying that the whole thing was a train wreck and he doesn’t want to have anything to do with it. When you've looked over this, it seems that he's quoting an article (there are a couple of articles now) saying that the New Atheism movement is done. The reason that it is is because the New Atheists have moved to the right. Is that what you're getting the complaint from PZ Meyers here? DR. CRAIG: That seems to be his complaint. He thinks that the New Atheism became captivated by the radical right, neoconservatism, Islamophobia, anti-feminism, and so forth. I get the impression that Myers isn't so much saying that the influence of the New Atheism is over, but that he's had it with the New Atheists, and he doesn't want to be a part of this anymore. He finds it extremely distasteful because it is in contradiction to his more progressive brand of politics. So he feels very alienated from the movement. But I don't think that he shows anywhere in his blog that the movement itself has ceased to exist or to exert influence. By 2014, many Americans had forgotten about New Atheism. For liberal Americans in the depths of the Bush years, anti-religious best sellers by Sam Harris, Richard Dawkins and Christopher Hitchens came as—for lack of a better word—a godsend. With the Christian right in the White House, and jihadist terrorism perceived to be a constant danger in the wake of 9/11, a vocal rationalist atheism appeared to many a natural and necessary counterweight. But after nearly six years of Barack Obama’s presidency, Bush and his born-again gang were far from the high seats of power, the War on Terror was no longer a feature of most people’s daily lives, and there was a widespread impression of leftward progress on social issues. The services of the anti-religious crusaders were no longer needed. DR. CRAIG: I wonder what he thinks today with the election of Trump. KEVIN HARRIS: Well, I wondered the same thing because when you compare the Bush presidency and Trump's presidency, Bush was a lot more moderate. DR. CRAIG: Yes. I think that’s fair. The odd thing though is that Meyers thinks that these New Atheists are basically in Trump's corner so to speak – that they are hyper-conservatives, as I say, Islamophobic and anti-feminist. They wouldn't be sympathetic with the #MeToo movement. That's why he has such disdain for these New Atheists – because of their right-wing politics. KEVIN HARRIS: That surprised me, too. That's what Jacob Hamburger says as well. These young atheists – they’ve all moved alt-right. They are white nationalists. They go on Reddit. They are not in any way sensitive to liberal policies and liberal sensitivities. They're very anti-politically correct. They are saying that this is what the New Atheists are now. That surprises me, and he may be right on that analysis. DR. CRAIG: For me as a philosopher, I don't follow the politics of these people. I couldn't care less what Christopher Hitchens’ or Sam Harris' or Richard Dawkins’ politics are. I'm interested in their critique of theism and their arguments for atheism. For me the political dimension is just not all that interesting. Dennett has basically retired from the fray. Maybe he was the smartest of the four [Four Horsemen of the New Atheism]. Although I would argue with him fiercely on his misunderstandings of evolution, at least he kept his discussions on a philosophical plane. Wow. He's talking about Sam Harris there. I think his complaint is that Sam Harris seems to be saying things that can be really interpreted as rather racist, at least as far as liberal people would say. DR. CRAIG: I was interested, too, in the anti-feminist tone that he perceives in many of the so-called New Atheists. It is just a fact that a number of their prominent figureheads have been found guilty of sexual harassment and misconduct, and so awards from the Humanist Society have been rescinded. Some of them have been banned from their own university campuses. Buildings have been renamed because of this. There's quite a number of these figures in the New Atheism that have been convicted of sexual harassment and other forms of misconduct. It's really quite amazing. KEVIN HARRIS: This is a two-page article that we’re looking at here. The main criticism is that he tended to go out on Twitter and tweet some things that just constantly irritated people. As a scientist, you’ve got to be very open, and I’m open to people’s belief in religion … I don’t think we’re in a position to deny anything unless it’s something which is within the scope of science to deny … I think as a scientist you should be open to it … It doesn’t end up encroaching for me because I think there’s quite a space between the two. And that is a very sensible position that Dawkins doesn't seem to appreciate. Religious beliefs are not something that fall within the domain of science except insofar as they might impinge upon the created world, and therefore this scientist is quite right in saying you need to be open to the possibility of these beliefs. KEVIN HARRIS: As we wrap up the podcast, he says that the Four Horsemen of the New Atheism are basically gone. Hitchens has died. Sam Harris can possibly be labeled with ties to bigotry and anti-feminist views. Dawkins has shot himself in the foot. And Daniel Dennett really isn't doing anything and never rose to the prominence of the other three. There's really not another group or another leader who's emerging as representative of atheism. There's still plenty of people who promote it like Bill Maher, but he is an obnoxious comedian. He’ll make you laugh but he's not representative. So the whole thing – New Atheism – has swung to this radical right it seems – alt-right. That's interesting. But it really does seem a lot of this shows that it's a political thing, therefore it's an emotional resistance to whether God exists and not a philosophical one. DR. CRAIG: Right. And for Myers himself, he continues to be an atheist. He just is repulsed by the politics of the New Atheist movement. But he remains a committed atheist and secularist. KEVIN HARRIS: I didn't expect this. We've been decrying the decline for so long in the UK, but The Times commissioned a study. The proportion who said that they do not believe in any sort of God or greater spiritual power definable as atheist fell from 38% in 2016 to 36% in 2017 and to 33% in 2018 with indications it is going lower. DR. CRAIG: That is very exciting. KEVIN HARRIS: Belief in God was steady right at 30%. Those who don't know increased from 12% to 14% – a little nudge there; while those who believe in some sort of spiritual greater power rose from 23% to 24%. Asked how often they attended church (not counting weddings or funerals), those who said never fell from 63% in 2016 to 61% in 2017 to 56% in 2018. By contrast, church attendance seems to be going back up. DR. CRAIG: That's a very welcome trend. I have a friend in England who helped to organize our 2007 and 2011 speaking tours in the UK. He wrote to me recently just remarking that there seems to be a new mood in the country and that they do seem to have turned a corner. People do seem to be open to the idea of Christian faith again. That just is anecdotal, but these statistics that you share from The Times seems to bear out my friend’s impression. That's very welcome. KEVIN HARRIS: It is. And finally it says that the proportion of people who pray has risen. So we pray that that continues. https://freethoughtblogs.com/pharyngula/2019/01/25/the-train-wreck-that-was-the-new-atheism/ (accessed April 7, 2019). https://thepointmag.com/2019/politics/what-was-new-atheism (accessed April 7, 2019). https://www.independent.co.uk/news/science/richard-dawkins-atheism-criticism-atheist-study-rice-university-science-scientists-a7389396.html (accessed April 7, 2019). https://www.thetimes.co.uk/article/atheism-is-down-as-uk-gets-spiritual-z00nxczn7 (accessed April 7, 2019).